As a Michigan driver’s license restoration attorney and DUI lawyer, I sometimes describe myself as being like a “Q-tip,” with one end of my practice being capped by DUI cases, the other end capped with license reinstatement appeals, and alcohol as the stick that connects them both. No matter how you look at it, alcohol plays a central role in everything I do. Because alcohol is so crucial to my day to day work, I completed the coursework in a University, post-graduate program of addiction studies in order to get a clinical understanding of the whole range of issues people have with drinking, from the development, diagnosis and, ultimately, treatment of alcohol problems. Based upon a recent comment, this article will be about what makes me different from 99% of the other lawyers fishing for your Michigan OWI or license restoration case. And although this article is about me, if you take the time to read it, you will learn what things really matter as you look for a lawyer, no matter who you ultimately hire. We can start this discussion with a simple question that has almost universal application, whether you’re looking to hire a lawyer, doctor, dentist, plumber, builder, mechanic, or anyone: Why should I hire you? When you think about it, that question makes so much sense that it’s actually easy to overlook. It may seem impolite to ask it outright (although I wouldn’t mind answering it), but if you’re not at least asking it of yourself as you sift through potential candidates for your own drunk driving or license appeal case (or anything else, for that matter), then you’re going about it all wrong. “Why should I hire you” (as opposed to someone else), or “Why should I buy this product” (instead of another) is precisely the question that should be asked anytime you’re shelling out money. In general, the correct answer is always going to be something to the effect that you believe that you’re getting the best service or product, or are otherwise making the best choice for your particular needs. So what makes me different (or at least makes me think I’m so different) from every other lawyer? The comment that inspired this article was actually the most recent of several similar comments made over the years to Ann, my senior assistant, by other lawyer colleagues. Recently, one of them was in my office to see me, and when Ann explained that I was in the middle of my usual 3-hour first meeting with a new client for a driver’s license restoration case, the attorney said something like, “He spends too much time in those meetings.” It wasn’t meant in an offensive way, but as Ann later pointed out, that would pretty much be the assessment of 99% of all the other lawyers. As Ann further noted, 99% of those other lawyers DO NOT have 3 support staff employees (if they even have one) for just themselves; none of them handles as many license appeals in their busiest year as I do in a single month; none of them has a blog with anywhere near a fraction of the information and analysis I give out, and absolutely none of them provides a guarantee to win his or her client’s license back, like I do. So yeah, I’m different, way different, but in a good way, and nothing could ever make me want to change that. As I noted, I’ve had other, similar comments. A lawyer who used to share office space in my building once told Ann that he thought I spent too much time with my DUI clients, because my first meeting with someone in a drinking and driving case typically lasts about 2 hours. My gut reaction to that is anyone getting less is being sold short. How can I get to know a person, get to know the details of his or her case, and cover the things I need to go over in an hour or less? In a very real way, it’s like the difference between a mass-produced, machine made product, and one that is crafted by hand. Sure, that ¢.50 cup of vending machine coffee comes cheap and fast, but it’s not nearly as good, at any level, as a slower, more expensive cup of Starbucks. That same lawyer wound up having to close shop in order to go work out of his house. By contrast, I handle more DUI cases in a month than he and the other 99% ever have in a year. You can get a feel for all of this by looking at lawyers’ web sites. They may look different at first, and use different background colors and pictures, but once you read a little deeper, you’ll notice that they’re all pretty much the same. Most of the time, the web company that designs and/or hosts the site will provide or help provide the content, trying to make it sound as “unique” as possible for each client. Sometimes, a lawyer will actually write the content him or herself, but having never spent any time communicating with the public in this way, those efforts are often worse than the generic stuff cranked out by the web companies. Does any reader in this world really care about the “mission statement” of some law practice? When I go online, I want information relevant and specific to what I’m looking for. If you’re looking for DUI information (key here is the desire for information, not some lawyer’s “mission statement”), it won’t take long to figure out, if you haven’t already, that a drunk driving arrest is serious, and it’s going to be expensive. Beyond that, you want information that’s helpful. A DUI in the Detroit area is different from on in Grand Rapids. In fact, a DUI in New Baltimore is going to be a lot different from one in Rochester. What happens to your license? How long does the process take? About how much is the whole thing going to cost? Most lawyers give a page or 2 of generalities and then urge the reader to call. Beyond the information on my website (a new one should launch by the summer of 2016), as of this writing, I have published almost 250 DUI articles (and over 330 license restoration pieces). That takes a lot of time, but that’s part of what differentiates me from 99% of the other lawyers out there. When a client hires me (my fees are reasonable, but not cheap, and unlike everyone else, I conspicuously publish them online because as a consumer myself, I hate dealing with operations that aren’t up front about costs), he or she expects to get answers, information, help and results, and the way I provide those things is a quantum level above what “everyone else” does. 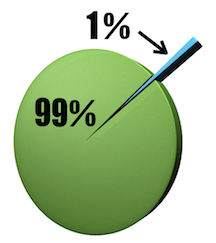 The 99 percenters essentially copy each other. I copy no one. Think about cars for a moment. Buick is a good brand; so is Chevy and Ford. When someone buys an Audi, however, or a Cadillac or a Lincoln or a BMW or Mercedes, they expect a whole different level of quality and service. If you have a Lincoln, for example, they’ll come and get your car for its free oil change, and leave you a loaner while your car is gone, and then bring it back. If you call a luxury car dealership, you’re treated like a genuine VIP. This is the smaller, high end of the auto market, however, and not the larger 99%. Can you overpay or be oversold? Sure. On the flip side, though, you can be sure that the buying, driving and service experiences at Chevy, Kia or Toyota will never compare to those at BMW, Lincoln or Mercedes. That’s just the way it is. The assembly line approach to everything is really the antithetical to quality. Hospitals are overflowing with people, so doctors have only minutes with each patient. Everyone has learned how to cut corners and become more efficient; to do more with less. Sometimes, though, that’s not good enough. When it comes to your life and the impact of a DUI charge, you really need to think about what’s important to you. For those with less to lose, the long term and ultimate results probably aren’t as important. I can only imagine things from the perspective of my life, but if I was facing a DUI, and everything else being equal, if one outcome resulted in me being stuck in weeks of counseling or rehab, and the other avoided a lot of that (because I don’t have any spare time to begin with), I’d certainly pay a premium to get out of everything I could. That may not be such a priority to someone else. This is why I noted, at the outset of this article, that most people either want the very best, or the best choice for their needs. My wife and I have one child, and she’s away most of the year in college. When it came time to look at most kitchen accessories and appliances, we could skip any of those meant for larger families, knowing that it’s usually just the 2 of us, or no more than 3, when our daughter is home. A family of 5 has very different needs than a mostly empty-nest couple. Sure, the extra-large Kuerig coffee maker seems like a technological wonder, but it’s not the best choice for our morning needs. That said, because we don’t need to brew gallons of coffee, I don’t need to worry about skimping on the brand of K-cups, either, because in the course of an entire month, we’ll go through less than that family of 5 will consume in a week. Let me break down my typical first meeting with a new DUI client: Allow 10 minutes for small talk (this is part of getting to know each other), 10 minutes for the client to express his or her primary concerns (very often, we’ll “hold” some of those questions for more comprehensive explanation a bit later on), and then 10 minutes for the client to give me his or her account of what happened. Next, I’ll have questions about the traffic stop and/or the first contact with the police, the field sobriety tests, and what happened at the police station, all the way from the ride to jail, the breath (or blood) test, to getting released. Almost without exception, my questions and the client’s answers turn into questions and explanations about other things (“They gave me this paper license; does this mean I can still drive?” or “They told me to call the court; how long will it be until we get a court date?”), so we can add at least another half hour there. Then, I have to explain the legal process and what will happen when we go to court. Finally, and perhaps what makes me most unique of all, I will spend at least another half hour introducing my client to the mandatory alcohol screening assessment, which is a written test that a person must complete, is required by law in every Michigan DUI case, and results in a numerical score that in VERY large part is used to determines if a person has, or is seen as being at risk to develop a drinking problem, and ultimately to decide what kind of classes and/or counseling the Judge should order. That’s the framework of doing it right, and doing it right in DUI cases takes more than an hour. Given the inherent “alcohol bias” the court system has to finding/preventing/treating these problems (even where they don’t exist) doing well at this crucial phase of the case is the single biggest determinant of how easy or not things are going to be over the next year or more. Why would you invest your money with someone who can’t or won’t invest their time to produce the best outcome in your case? At that first meeting, I only intend to introduce my client to the more important principles of the assessment. I don’t expect my client to remember everything. That’s why we’ll have another meeting before the client ever goes in for the actual screening and meeting with a probation officer. You can be sure than 99% of the other lawyers don’t do that. This time I spend with my clients is how I help my clients avoid as much of the fallout as possible from a DUI case. It’s why my clients do better. I could skip all of it (although this thing I have called a “conscience” probably wouldn’t let me do that even if I wanted to) and cut my time with a DUI client down by about two-thirds, but that’s not me. It’s easy for most lawyers, who don’t see the connection between the screening, the results thereof, and the ultimate counseling or treatment ordered, to overlook this, but because I see the direct connection and have the clinical knowledge and practical experience to both see it and do something about it and thereby actually make things better for my clients, I am compelled to act. I love analogies (can’t you tell? ), so the difference here is kind of like asking a fine custom furniture maker to just slap something together quickly out of scrap wood; he can’t do “average” work. Do I spend more time with my clients than most lawyers? Sure, and probably more so than 99% of the rest. Do I spend more time than necessary? Never. That’s why I get results that are in the top 1%. My clients are the type of people and professionals with lots concerns and questions; the type who invest their time reading articles like this. Whatever else, I have always believed in treating others as you would want to be treated, and I cannot imagine, nor would I ever accept anything less for myself than what I provide to my clients. As much as I may be different from 99% of the other lawyers out there, it’s probably fair to say that my clients, as individuals, are also different from 99% of everyone else. I guess that, in a kind of poetic justice way, those of us who have never been part of the “herd” mentality always gravitate to each other. If you’re facing a DUI or you need to win back your driver’s license after multiple DUI’s, do your homework. Read everything you can, see what the other 99% have to say, and, when you’re ready, pick up the phone and call around. I guess that’s yet another way I’m different from everyone else, because I encourage everyone to do their research and gather information instead of just saying “Call now!” When you do start making your calls, you can reach my office, Monday through Friday, from 8:30 a.m. until 5:00 p.m. (EST) at 586-465-1980. We’re here to help.